Duncan Aviation recently refurbished a 12-year-old Gulfstream G550, giving it a whole new interior, a new exterior paint scheme, and an upgraded CMS (Cabin Management System). During this refurbishment, we also performed scheduled maintenance to minimize the impact of the downtime for the client’s flight schedule. In addition to the newly painted exterior and company logos to match the fleet, the aircraft was the recipient of the first Honeywell Ovation CMS to be installed on a Gulfstream G550. 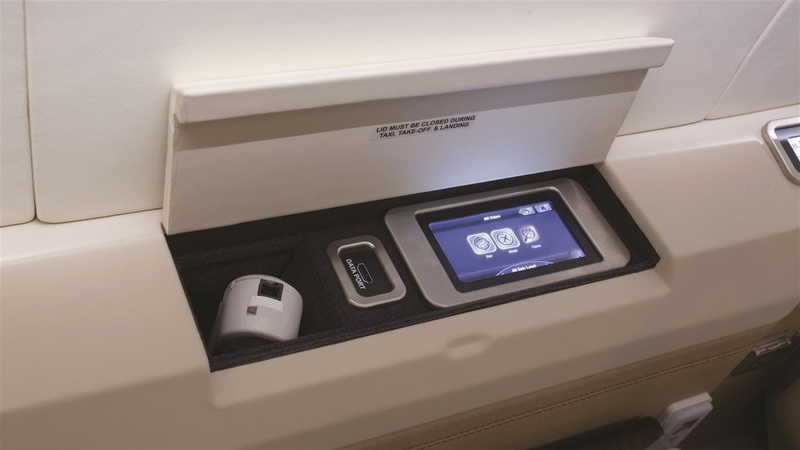 Whether passengers are looking for entertainment or a few quiet hours of productivity, the all-digital Honeywell Ovation CMS interfaces with a variety of carry-on devices (Smartphones, iPads, laptop computers) and gives passengers a range of controls for maximum comfort. 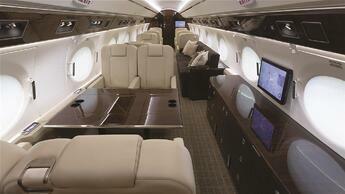 Typically, the cabin monitors in a Gulfstream are inset in the windows. Instead, Duncan Aviation Lead Designer Rachael Weverka’s design included one flush-mounted, 22-inch monitor on the right-hand forward partition and one, 19-inch monitor mounted aft on the sidewall over the credenza. After nearly two years of planning and preparation, our client brought the G550 to Lincoln in June 2016, and we delivered the completed aircraft on budget in September 2016. A client representative was on-site while the aircraft was here, and as part of the team, the representative attended the daily team meetings, was involved in day-to-day decisions, and had access to every Duncan Aviation team member who touched the aircraft. Read about the rest of this project in the Spring 2017 Duncan Debrief magazine.